My major focus is to explore the biological role of O-glycans in health and disease. I am a co-PI at the DNRF Copenhagen Center for Glycomics where I lead the GlycoCell projects on O-glycans in peptide hormone biology, lipid metabolism, LDLR function and protein stability. Traditionally, O-glycans have been found and associated with large mucins containing P/T/S rich domains with high density of O-glycans, where they serve important functions for the structure and stability of mucins required for lubrication and protective effects on lining mucosa and in body fluids. However, recent proteome-wide discovery strategies for O-glycosylation demonstrate that O-glycans are abundantly found on all types of proteins (>80% of all proteins trafficking the secretory pathway are O-glycosylated, Steentoft et al., 2013), and in particular found in more isolated sites often in close proximity to other important PTMs such as PC processing sites, phosphorylation sites (not published), mannosylation sites, ectodomain shedding sites, and most recently activation of G-coupled protein receptors (GPCRs), where they may serve important (co-)regulatory roles in fine-tuning protein functions (Schjoldager et al.,2010, 2011, 2012, Goth et al., 2015, 2012). Our breakthrough in O-glycoproteomics has opened for wide discovery of O-glycoproteins and is now driving a plethora of exciting novel hypotheses of the role of O-glycosylation for diverse types of protein including GPCRs and LDLR related proteins. Figure 1. Schematic depiction of site specific protein O-glycosylation and suggested biological function. Site-specific O-glycosylation is catalysed by selected isoforms in the large GalNAc-T family and is often found between protein domains in linker regions of varying length. We have demonstrated that O-glycans can modulate limited proteolytic processing by a number of proteases and thereby regulate protein activation, stability and solubilisation. We have also demonstrated that O-glycans are found in shorter linker regions in lipid binding domains in members of the LDLR family where deficient glycosylation impair lipoprotein particle binding and uptake. Numerous studies, from our lab and others, have revealed non-redundant and isoform specific functions of GalNAc-transferases (Kato et al. 2006, Schjoldager et al. 2010, Pedersen et al. 2014, Khetarpal and Schjoldager et al. 2016). These results were generated in knock-out/knock-in systems displaying the abstract effects of complete loss or gain of GalNAc-transferase function. 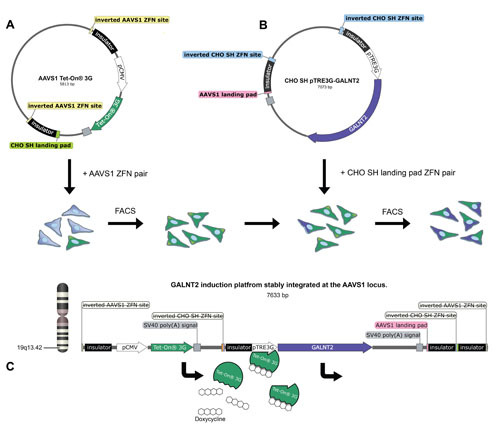 The GALNT genes are often found as candidate genes associated to complex disease traits in Genome-Wide-Association Studies (GWAS). Recently, we validated one such candidate genes, GALNT2, with a GWAS predicted role in regulating HDL and TG (Khetarpal and Schjoldager et al. 2016). We furthermore demonstrate that the GWAS signal for GALNT2 and low HDL is located in the first large intron of the gene close to a liver-specific regulatory element, and several studies have demonstrated that the GWAS SNP signal induced allele-specific transcription differences (Roman et al. 2015, Cavalli et al. 2016). We hypothesize that within the subset of non-redundant GalNAc-T functions hide substrates that are far more sensitive to changes in expression of a specific GalNAc-T, substrates that are selectively regulated in a “fine-tune” manner. To address this, we combined the use of precise genome editing tools and last generation Tet-On system to generate isogenic HEK293 cells in which GalNAc-T2, GalNAc-T3 and GalNAc-T11 can be induced within wild-type range. By subjecting differentially induced isogenic cells to quantitative O-glycoproteomics explore dose-dependent functions of GalNac-Ts ex vivo. Figure 1. Generation of GalNAc-T2 inducing Hek293 cells by precise integration of inducible transcriptional elements. Precise integration is achieved using a heterodimeric zinc-finger nuclease (ZFN) pair that simultaneously; targets the genome and in situ linearizes the donor plasmid enabling it to be “ligated” into the genome6. A) AAVS1 Tet-On®3G plasmid was co-transfected with AAVS1 zinc-finger (ZFN) plasmids into Hek293 T2 KO cells. The ZFNs are tagged with GFP or Crimson enabling FACS enrichment of cells expressing both ZFNs. The recovered cell bulk was single cell sorted and positive clones identified by junction PCR. Positive clones with correct integration of AAVS1Tet-On®3G contain the CHO safe harbor landing pad (CHO SH landing pad) downstream of the Tet-On®3G gene. B) The CHO SH landing pad can be targeted for integration using a second ZFN pair analogous to AAVS1 Tet-On®3G integration. Hek293 T2 KO Tet-On®3G positive clones were transfected with CHO SH pTRE3G-GALNT2 together with CHO SH ZFN plasmids, enriched by FACS and subsequently single cell sorted. Positive clones were identified by junction PCR and ability to express GalNAc-T2 when induced with doxycycline. C) Upon addition of doxycycline (dox) to cell culture media the Tet-On 3G transactivator binds to and activates expression from TRE promoters. In a large international collaboration, we have validated a genome-wide association study (GWAS) linkage between O-glycosylation (the GALNT2 gene) and dyslipidemia in multiple species, including rare individuals we identified with homozygous loss of the gene. Using genetic engineering (ZFNs and Crispr/Cas9) and a novel strategy for quantitative differential glycoproteomics, we demonstrated that loss of the GALNT2 gene specifically affects high-density lipoprotein cholesterol through non-redundant O-glycosylation of several known important regulators of lipoprotein metabolism including ANGPTL3 and phospholipid transfer protein (Khetarpal and Schjoldager et al., 2016 and Schjoldager et al. 2015). 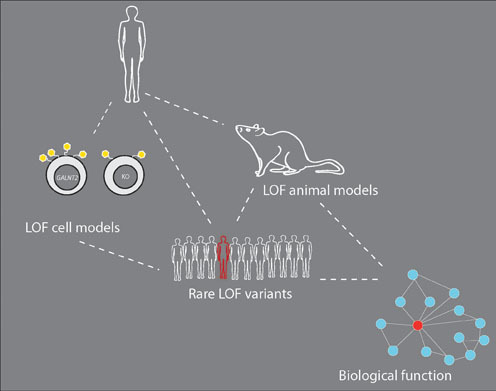 Now ongoing studies focus to dissect molecular mechanisms using our animal models and further demonstrate that the GALNT2 gene is a common regulator of human metabolism. Figure 1. SNPs in GALNT2 are associated with HDL-C metabolism, but whether GALNT2 causes HDL-C to go up or down has been debated. In this project, we have demonstrated that loss of function of GALNT2 reduces HDL-C in humans, rodents, and nonhuman primates. Using these models, precise genetic engineering to produce isogenic cell lines, state-of-art glycoprotein mass spectrometry and RNA seq expression analysis we identify and explore GalNAc-T2 specific glycosylation targets. Peptide hormones, neuropeptides or bioactive peptides are small polypeptides with important biological functions. O-glycosylation is a post-translational modification that takes place in the Golgi where up to 20 different isoenzymes glycosylates proteins travelling through the secretory pathway. Through O-glycoproteomics analysis of tissues and biological fluids we recently identified O-glycosylation on mature peptide hormones in biologically important regions. We have identified O-glycans on a number of major therapeutic targets for drug development in endocrinology and in preliminary data, we have shown that O-glycans on peptide hormones can alter receptor signalling and give resistance to proteolytic degradation in vitro. In this project, we join experts from glycobiology and endocrinology to explore and characterize the biology of O-glycans on peptide hormones. Christina Christoffersen (Rigshospitalet, Department of Clinical Biochemistry. Pre-graduate teaching in Cell Biology and post-graduate teaching in Glycobiology at the Faculty of Health Sciences. Bennett, E. P., Chen, Y-W., Schwientek, T., Mandel, U., Schjoldager, K. T-B. G., Cohen, S. M. & Clausen, H., 2010, In : Glycoconjugate Journal. 27, 4, p. 435-44 9 p.
Steentoft, C., Schjoldager, K. T., Cló, E., Mandel, U., Levery, S. B., Pedersen, J. W., Jensen, K. J., Blixt, O. & Clausen, H., 2010, In : Glycoconjugate Journal. 27, 6, p. 571-82 11 p.
Schjoldager, K. T-B. G., Vester-Christensen, M. B., Bennett, E. P., Levery, S. B., Schwientek, T., Yin, W., Blixt, O. & Clausen, H., 2010, In : Journal of Biological Chemistry. 285, 47, p. 36293-303 10 p.
Pedersen, J. W., Bennett, E. P., Schjoldager, K. T-B. G., Meldal, M., Holmér, A. P., Blixt, O., Cló, E., Levery, S. B., Clausen, H. & Wandall, H. H., 16 Sep 2011, In : The Journal of Biological Chemistry. 286, 37, p. 32684-96 13 p.
Gram Schjoldager, K. T-B., Vester-Christensen, M. B., Goth, C. K., Petersen, T. N., Brunak, S., Bennett, E. P., Levery, S. B. & Clausen, H., 18 Nov 2011, In : Journal of Biological Chemistry. 286, 46, p. 40122-32 11 p.
Steentoft, C., Vakhrushev, S. Y., Vester-Christensen, M. B., Schjoldager, K. T-B. G., Kong, Y., Bennett, E. P., Mandel, U., Wandall, H., Levery, S. B. & Clausen, H., Oct 2011, In : Nature Methods. 8, 11, p. 977-82 6 p.
Schjoldager, K. T-B. G., Vakhrushev, S. Y., Kong, Y., Steentoft, C., Nudelman, A. S., Pedersen, N. B., Wandall, H. H., Mandel, U., Bennett, E. P., Levery, S. B. & Clausen, H., Jun 2012, In : Proceedings of the National Academy of Sciences USA (PNAS). 109, 25, p. 9893-8 6 p.
Schjoldager, K. T-B. G. & Clausen, H., Sep 2012, In : BBA General Subjects. 1820, 12, p. 2079-94 16 p.
Steentoft, C., Vakhrushev, S. Y., Joshi, H. J., Kong, Y., Vester-Christensen, M. B., Schjoldager, K. T-B. G., Lavrsen, K., Dabelsteen, S., Pedersen, N. B., da Silva, L. P. M., Gupta, R., Paul Bennett, E., Mandel, U., Brunak, S., Wandall, H. H., Levery, S. B. & Clausen, H., 15 May 2013, In : E M B O Journal. 32, 10, p. 1478-1488 11 p.